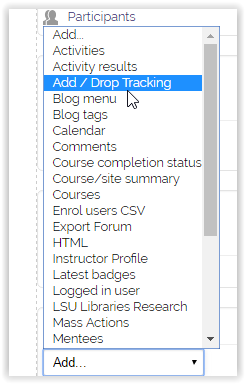 The Add / Drop Tracking block links to a page where instructors can see the date and time students added and/or dropped the course. *NOTE: You will need to do these steps if you do not see the Add / Drop Tracking block on your Moodle course page. 1. Log into your course and click the green Edit button to turn editing on. 3. Locate the Add/Drop Tracking block and click the Actions button (cogwheels). Then, click on Delete Add/Drop Tracking block.